For those that have followed this site, you probably have figured out that I have an affinity for Yosemite, some, like my wife, may say an obsession. Most people experience Yosemite in the Spring and Summer but I'm told the best time to see Ansel Adam's playground is the Winter. One of the most spectacular, and elusive, Winter highlights in the valley is the "Firefall at Horsetail Fall". 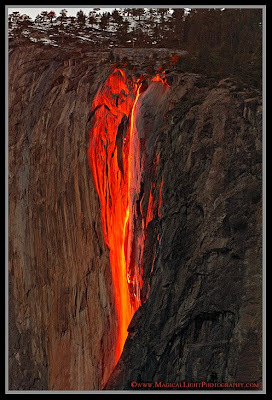 Not many people even know that there is a Horsetail Fall in Yosemite! Horsetail Fall is an ephemeral fall and usually gone by late Spring. The firey glow happens when the sunset hits the ribbon stream coming down the eastern side of El Capitan. Yosemite's original Firefall was a real bonfire pushed over the cliffs at Glacier Point where eager spectators watched the glowing embers fall to the valley below. The first firefall, using real fire, started in 1871 and eventually it was a staple attraction in the valley until 1968 when the event was stopped because of the damage it was doing to the valley's meadows. The first time I heard about the "natural" firefall and saw images of it's existence was last June while in the Ansel Adams Gallery in Yosemite Village. I was there with a few friends preparing for a 5 day trek into the back country and saw a stunning photo of a glowing ribbon of fire. After seeing that, I knew I had to experience it in person. I started doing some research and found that the best time to see the Firefall was in February. The best information I found was at LittleRedTent.net and YosemiteBlog.com. Edie at LittleRedTent is a Yosemite Valley resident and a regular contributor to YosemiteBlog. She has a very informative article on How to Photograph Horestail Falls and also has many galleries of beautiful photographs. YosemiteBlog.com has always been a favorite site of mine and Lyod just started a forum and someone asked a question about the Firefall and a wealth of information was presented from a number of different sources. Rather than rehash all the little details, I'll get down to the point. The best time to view the Firefall is in the middle of February. This year's optimal time is February 12 - 22. For a detailed explanation why this is the case, check out Photographer Michael Frye's excellent article on Photographing Horsetail Fall. There are two locations to photograph the Firefall: the El Capitan Picnic area on Northside Drive and near the Merced River on Southside Drive. Just look for the mass of photographers. One word of caution, getting to these locations can be trickier than you think depending upon the traffic pattern setup in the valley. Sometimes all traffic is routed on one road or another which means a one mile hike to get to your spot. Bring snowshoes just in case! Knowing the time and place is all well and good, however, the weather must cooperate. The Firefall does not exist if the sun is not setting on it. This weekend's forecast is for snow showers off and on so there is a good possiblility I'll be looking at gray clouds and snow flakes, but heck, I've got to try. I think now you know why I called the Firefall elusive. The spectacular photo above of the Firefall is courtesy of CHUCK CAGARA from www.MagicalLightPhotography.com. Chuck is a marvelous photographer and I encourage you to check out his website. His work has inspired me and I am hoping to experience something similar, wish me luck!